-- WE: This is powered by tannins while also keeping its fresh fruit intact. There is a mineral texture that’s layered with a juicy fruit character on the finish. 93-95/100 -- Parker: Only 40% of the crop made it into the grand vin, which achieved 12.95% natural alcohol. 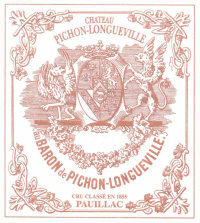 The final blend for the 2011 Pichon Lalande was 78% Cabernet Sauvignon, 12% Cabernet Franc, 8% Merlot and 2% Petit Verdot. Under the administration of the new owners, the Merlot component has been dramatically reduced in favor of more Cabernet Sauvignon in the final blend. A strong effort, the 2011 boasts a dense ruby/purple color and abundant aromas of black currants intermixed with unsmoked cigar tobacco, serious body, more concentration than most of the classified growths, and a bigger, more structured style that may suggest a subtle change in the winemaking philosophy at this estate. This impressive wine is one of the vintage’s most interesting efforts. It should drink well for 15-20 years. 92-94/100 -- Gerstl: Schwarze Beeren und Pflaumen, Teer Tabak, duftet dezent süss aber auch wunderbar nach frischer, reifer Frucht. Ein Traum am Gaumen, ein geniales Fruchtbündel, gebaut auf eine seidene Tanninstruktur, was für eine köstliche erfrischende Deliktesse, eine etwas schlankere aber eine sagenhaft raffinierte Version von Pichon-Baron 19/20, 2018 – 2040.